A friend found the other mermaid (hers, by Aurora) and the two seahorses (gifted to me). The blue seahorse was originally a pale grey (few actual horses are white, mostly they are grey) by Our Generation. The black was a black horse by Our Generation (coat a bit battered so I repainted him). They're to scale with the American Girl dolls and their horses (which are no where near as cool as the Our Generation horses). While the heads are a little clunky, they have nice expressions, pretty good anatomy, good poses and really cool flowing hair. I repainted the grey with Rustoleum Oasis, ModPodged the surface and threw on some glitter. You can never have too much glitter. So the next step is obvious, build mermaid saddles. Mermaids have one tail fin, not two legs, so they have to ride sidesaddle. (You can google that and find numerous insanely gutsy women doing insanely gutsy things with both legs on one side of the horse). I had one saddle; the blue horse came with a slightly battered pink saddle, an English hunt seat type with, oddly, western stirrups (also could be competitive trail riding type stirrups). The girth "buckle" was irritatingly dysfunctional, so I cut it off and used some velcro dots. The somewhat overloved (used, and stained) saddle was impossible to thoroughly clean, or repaint, so I built it up with foam, sticky back foam, and covered it in glittery tule. The tule drapes nicely and sticks like velcro. You can also glue it. You can use tracing paper, a clear plastic bag, or other transparent film to trace existing shapes (in the saddle, or the horse's back), copy onto your foam shape and cut out. For the second saddle, I cut a felt pad, shaped like the kinds of pads we use under real English saddles (used the pink saddle as reference). Then cut a slightly smaller pad out of dark blue glittery sticky back foam. The sticky back foam is easier to shape, squish, and form. Make sure it isn't pulling loose by the next day. A few more mermaids and horses joined the crew. The existing saddles showed need of upgrades. For one, sticky back foam is Pure Evil. It does not sticky for long. It does not sticky in wet, it does not sticky in sand, it does not sticky in vans (winter or summer ones), it does not sticky after a three hour drive, it does not sticky in salt air, or damp air, or any air near water. Which is where mermaids are. Use normal foam with real glue, or stitch it. I modified the blue saddle with ModPodge (as glue) and pins (those nice pearl headed ones). This one is made from glitter sticky foam cut in the shape of an English saddle (based on the pink saddle that came with the blue "seahorse"). The cantle (back) is made from thicker foam, covered in the glitter foam, edged with glitter foam. It tends to not sticky. The velcro holding the girth together does not sticky either, so it got stitched. I pinned the edge of the cantle, stitched other parts, and it works. It is attached to a felt pad that looks like the kinds of saddle pads we use under real saddles. It has a seashell glued on the back of the cantle. The pink saddle got a saddle cover made of felt, and stenciled with acrylics. I stitched the velcro onto the girth, the sticky does not sticky. There is a nice overgirth of tule; basically, I tie the whole thing on with a piece of tule, it looks fabulous. 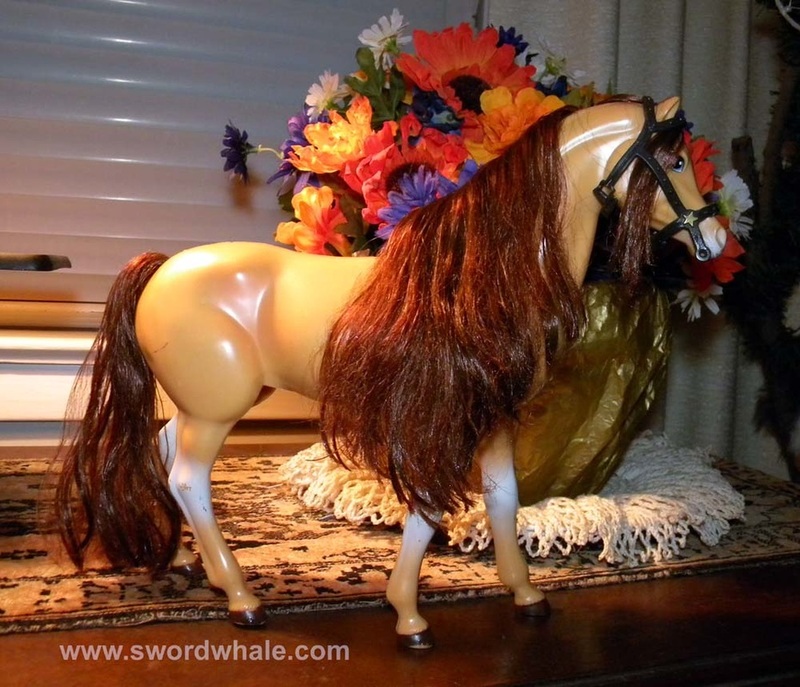 The cantle on this one was made with wire stuck through the back of the plastic saddle, and glitter foam glued to it. The random fin holders (bent flaps on the sides of the saddles) that echo the horns on sidesaddles were removed. They did not hold mermaids on anyway. For saddle covers and saddle pads, I placed felt under the saddle, then traced around it (chalk works well)(also some color pencils). I adore tule, it is gorgeous, light and faerie like, and Does Not Die. Ever. But glued on as saddle covers it flows in the wind, goes the wrong way, and comes off. So I relegated it to a nice girth and to some small bits. You can take your mermaids to the beach, or photograph them against a green screen ...or blue, or some other color, the trick is to remove the background, leaving just the mermaid and horse, and move all that to a nifty background. Dowel rods and pipe cleaners (aka "chenille stems" at your craft store): priceless. Stick rods in sand, use pipe cleaners to tie mermaids to them, keeps everyone from falling over. Pipe cleaners can also be wound around mermaids arms and legs to pose them, or tie them to the saddle or horse. I have two scales of mermaids here; they could be photographed with the little one as a kid on a pony, or the smaller one could be placed slightly in the background... things in the distance are smaller. Or she could be placed closer to the camera so she appears the same size as her sister. 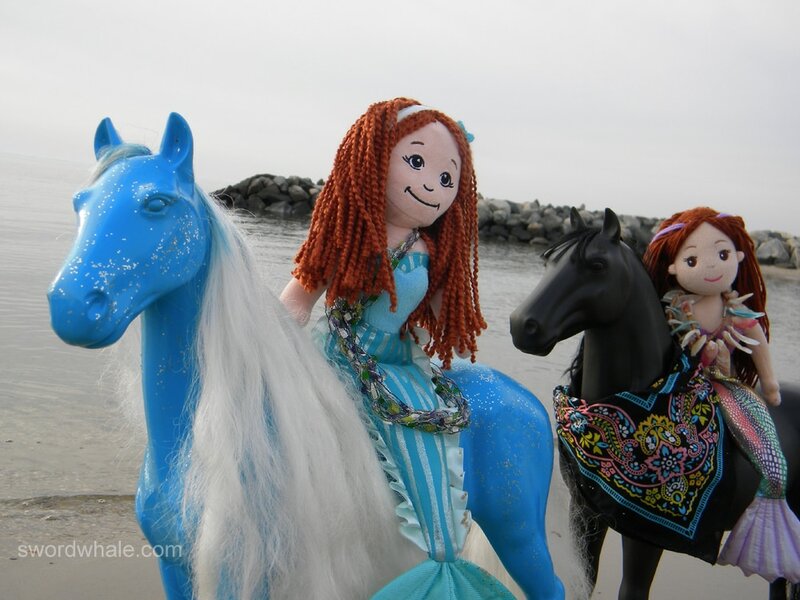 More mermaids (and other characters) joined the crew and various horses were tried out. 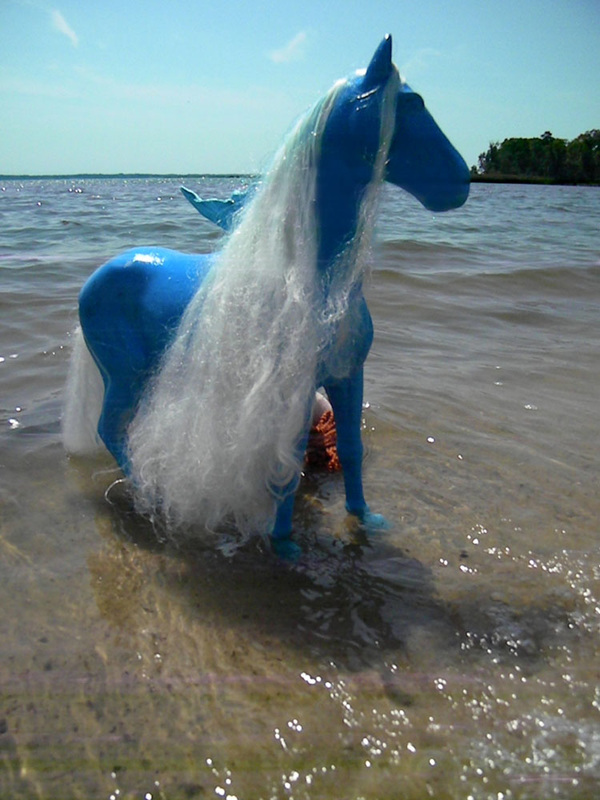 The Barbie dun peeled in the waves (the ModPodge came off the paint when wet) and is relegated to dry land. A couple of breyers were tried, they make nice ponies. My favorites are the Johnny West horses (Flame and Thunderbolt) from the 60s. Flame is a lovely vintage palomino, but the Thunderbolts were a gawdawful attempt at a countershaded chestnut that suffered epic fail. So I painted them black. They will get better saddles. 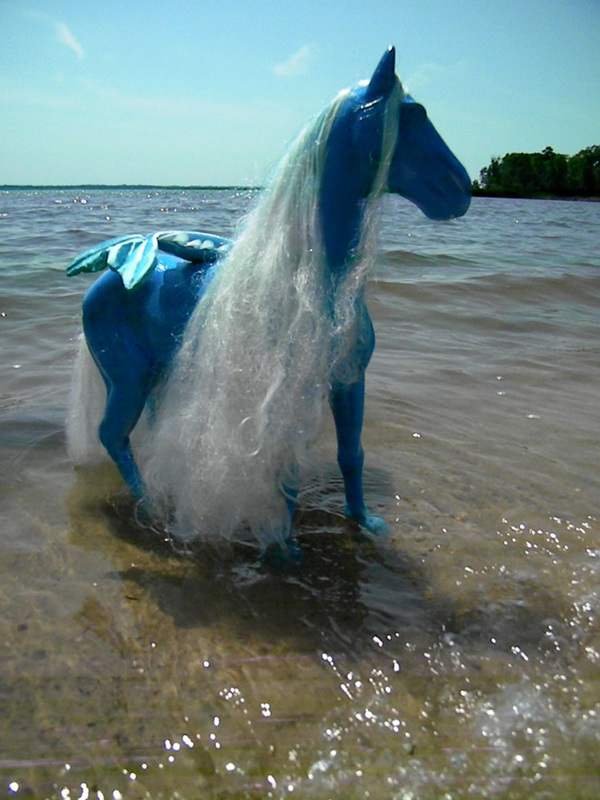 The dun pony began as a Barbie horse, found at a yard sale or maybe a thrift shop by a friend. It's not a bad horse toy, except for the pinched barrel (behind the shoulder, very narrow), possibly designed that way to accommodate Barbie riding. And the kind of awful fashionista eyeball design. And the stupid vague white marks on knees and hocks (whatthebleep color is that supposed to be?!?!?!?). I repainted the eye to the sort you'd find on a bald faced pinto, the face to white with pink skin showing through the short velvety hair of the face, and the legs white (pinkish hooves go with white leg markings). A little human hair conditioner (or was that mane and tail conditioner?) defrizzed the mane and tail. I ModPodged the entire horse (gloss ModPodge); the original body finish was well worn glossy, and the craft paint I used for the markings was a matte finish. Below, the original Barbie horse (and another one that got turned into a sand sculpture).